My husband LOVES basketball. A friendly game at the park was actually our first date. 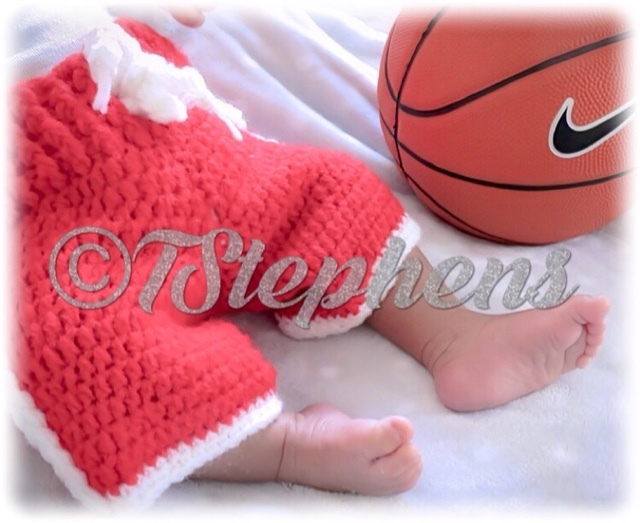 When I started thinking about DIY newborn pics for our baby boy, the idea for a basketball themed photo shoot seemed like a no-brainer. Not only would it be cute but a nice surprise for hubby when he'd see his son all decked out in a mini jersey. Let me say that jerseys for infant are still expensive!! (at least for my taste). I remembered seeing all those cute crochet newborn outfits and did a search to find if any basketball ones existed (for a reasonable price and decent shipping time). After searcing Ebay, etsy and Amazon, I purchased a cute crochet headband and shorts set for less than $10. Considering that I was taking the photos myself, these were a great buy even if he only wore it once. A clean white shirt and new mini basketball completed the outfit. We are so pleased at how cute the photos came out. I used them to make birth announcements from Shutterfly that we finally mailed out last week to family and friends. I love his outfit so much. I'm hoping he can wear it for Halloween, but considering how fast he's growing (almost 12 lbs at 1 month old!) I'm a little weary. Either way, this outfit is going into his keepsake box.